He is equally happy delivering a story in a board room setting or an auditorium. His latest book, The Acquirer’s Playbook offers a practical guide on how to beat the odds of successful deal making. He has published books on entrepreneurship, mergers & acquisitions, management buy-outs and how to sell your company. The Smith Report Blog has published posts almost ever week since 2008 and has a strong following around the globe. As a young athlete Ian was a member of the Scottish International track squad at 800m. He returned to track in 2006 as a more mature masters athlete and has enjoyed world-class status since his return. 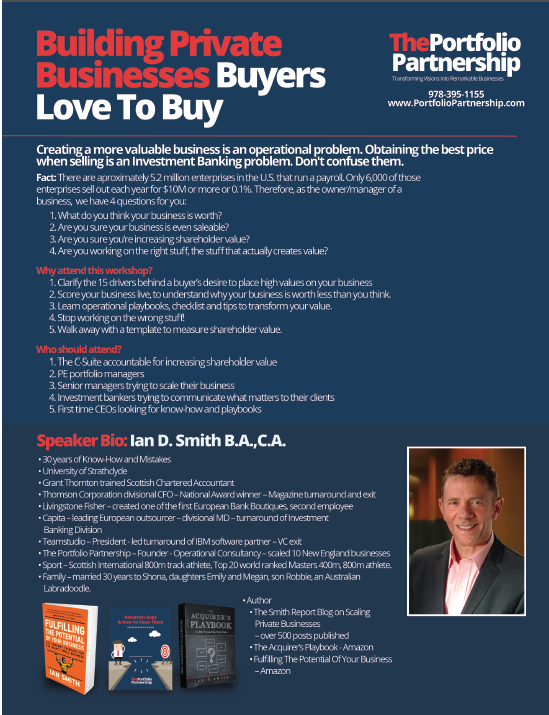 To book a paid speaking gig contact Ian at ian.smith@portfoliopartnership.com. The Acquirer’s Playbook Launch Party & Why Acquisitions Fail.